In a previous Point of Articulation column (KIMOTA! Neil Gaiman vs. Todd McFarlane), we broke down all the brouhaha surrounding the infamous lawsuit and what it meant for fans. We explained that Neil won his case; that the jury decided that he did in fact own 50% of Angela, Medieval Spawn and Cogliostro; that Todd had breached two contracts, in 1992 and 1997; and that Gaiman was owed money for both of them. Rather than persue the breach of the 1997 contract (the one in which he gave up his rights to the Spawn characters in exchange for any Miracleman properties that McFarlane held), Gaiman chose to retain his share of the characters. Todd, of course, appealed the decision. And this past February, the decision came down. You've probably already heard the result of the case, but we've been busy, and someday someone unfamiliar with the entire thing is going to be looking for a recap, and we'll be here to provide it. In 1992, Neil Gaiman wrote the script for Spawn #9, at Todd's request. There was no signed contract for the work, just a handshake deal in which Todd promised to treat Neil "better than the big boys," meaning of course Marvel and DC. In the end, Gaiman asked just to be treated equally as well as DC was treating him. McFarlane's lawyers claimed this request meant that Gaiman was then doing Work For Hire - like most creators do for the big companies - and thus, anything he added to the story would belong to the company. But the court decided that since Marvel and DC make creators sign a contract specifying that they're doing Work For Hire and Todd didn't have Neil sign any such contract, it definitely was not WFH, so he fully owns whatever he created for the comic: in this case, it's the idea of Medieval Spawn (or Old Time Spawn as he was called then), Cogliostro and Angela. So why, then does Gaiman only get 50% of the rights? Because the design of the characters (ie, Todd's art) is a separate component, which Todd continues to own himself. That means neither of them can use the characters without paying the other his share. Another issue raised was whether or not the statute of limitations had expired. Federal copyright law gives you three years to sue once you discover someone is claiming to own something you created. Fair enough. 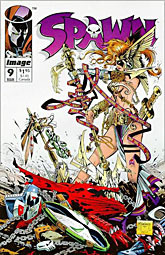 Todd tried to say that the legal indicia in Spawn #9, Gaiman's Angela miniseries and subsequent tpbs of both were notifications of the claim. The court shot this down, as well, saying that the language in the original was ambiguous, and that Gaiman (or any author) shouldn't be expected to read the copyright statements in the reprints. McFarlane had also registered his supposed copyright, but again, it would be ridiculous to expect Gaiman to be religiously checking the Copyright Office records. Plus, Todd had previously referred to Neil as "co-creator" and paid him some royalties, both which showed that he recognized the legitimacy of Gaiman's claim. The first unambiguous claim of sole ownership was in a letter from February of 1999 - Neil filed suit in January 2002, beating the deadline by a month. In reality, though, the statute of limitations wasn't even an issue, because the suit had nothing to do with copyright violations: as co-owner, Todd had every right to use the characters; but as we said above, he had to pay Neil his share. In the appeal, Todd had acknowledged that Neil co-created and co-owned Angela; for this case, he was only disputing Cogs and Medieval Spawn, claiming that they were uncopyrightable. He said that Cogliostro was a stock character, and that Medieval Spawn was just a derivative of Spawn. The ruling? Cogliostro has enough distinction from the standard "wisened sage" cliche to set him apart; and Sir John of York was indeed a derivative of Al Simmons, but only superficially. Both characters were eligible for copyright, and thus both characters were co-owned by both their creators. Todd still owed Neil the money. So why did Neil keep his rights to the characters, rather than exchange them for Todd's part of Miracleman? Because it turns out Todd didn't actually have any part of Miracleman. What he owned - having purchased it from Eclipse Comics - was the (lapsed) trademark for the Miracleman logo Eclipse used. None of the art, none of the story, just the logo, and since it hadn't been used for years, the trademark was dead. Todd has tried to re-register the "Miracleman" trademark, but Gaiman's Marvels and Miracles LLC is opposing it. So when he made the Miracleman statue and minifig, he didn't actually have any rights to do so. You can read the judge's actual decision in the case (as well as listen to the oral arguements) at the Seventh Circuit Court of Appeals' website. Judge Posner's decision is straightforward and easy even for a layman to understand, and shows a very good grasp of all the concepts involved - he even provides a detailed recap of Spawn's origins that would be right at home in an OAFE review. Neil wrote about the end of the case in his own blog here and here. So is this the end of the entire debacle? Knowing Todd McFarlane, probably not. He released the Miracleman statue after losing the first court case, so now that he's completely lost the appeal, he'll probably come up with some excuse to infringe on copyrights again in the near future. He really is like a petulant infant, lacking any kind of outside awareness whatsoever. He'd already found a way to write Angela out of the story, and has significantly revamped Cogliostro, both in hopes of never having to pay Neil again. Honestly, it's a bit sad. But at least he's no longer a player in the Miracleman issue, which means we're at least one small step closer to a resolution there.